Boil potatoes in large pot, in salted water. Cook until potatoes are tender, and remove from heat. 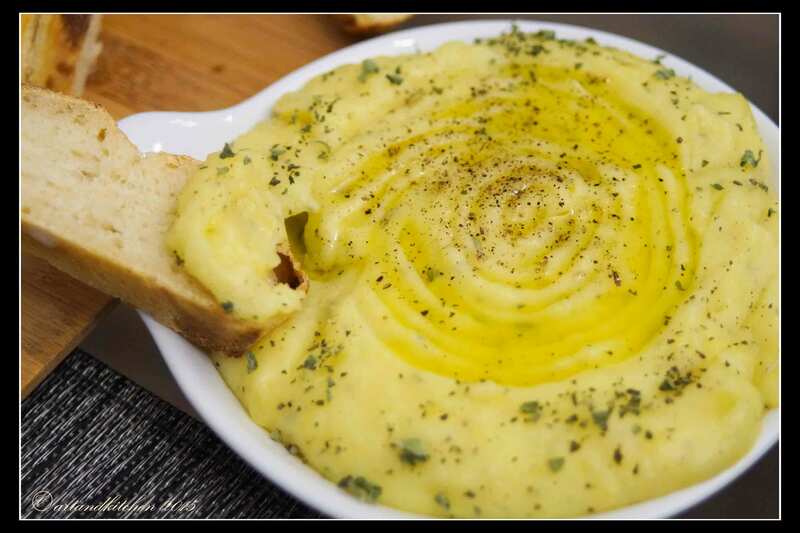 Mash the potatoes in a mixer, along with the garlic, salt, pepper, oregano, olive oil, water, lemon juice, and vinegar. Only mix a few seconds until ingredients are well blended. Make sure you do not over mix. We typically eat Skordalia served cold, but you can enjoy it either warm or cold. Serve with fish, chicken, or any side vegetables. In a large saucepan, add the oil over medium heat. Peel potatoes, and cut your potatoes into chips. Place potatoes into hot oil, and fry until each side of the potato is golden brown. Remove from oil, and drain oil over a plate, lined with a paper towel. Season with spices, lemon, and salt. **There you have it, three different ways to make Greek style potatoes!! I hope you enjoy this post as much as I did. From Kouzounas Kitchen to your home, Kali Orexi. This post is brought to you by Kouzounas Kitchen. Each photo has full credit to Kouzounas Kitchen. You may not re-use any of these photos, without permission to this site owner. Thank you. Aww I appreciate that!! I’m happy you enjoyed. Yes that’s true, with Skordalia we must stay away from anyone ha! They are all so great, different and delicious! If I would have to choose only one, this would be difficult challenge! Thanks a lot! My pleasure! Glad to have you with us! WOW! I’ve just made your skordalia and it came out super delicious! I mashed the potatoes simply with the fork and added all the ingredients listed. I found the addition of oregano a big improvement compared to the recipe I used before! Thanks a lot for posting this recipe! Oh wow, really? I am very happy to hear that. 🙂 You’re very welcome. I reblogged your post just now. Thank you for sharing, and happy you enjoyed. Your pictures are on point. Makes me feel like I’m right there.